One of the biggest sporting events ever held in Scotland is helping to put the country's venues under the international spotlight, with those boasting golf courses set for a Ryder Cup boost. The bi-annual showdown between the finest golfers in Europe and the United States takes place at Gleneagles next week from 23-28 September. The PGA Centenary Course at Gleneagles will be graced by the likes of Rory McIlroy, Sergio Garcia and Bubba Watson and the competition will help to cement Scotland’s status as the Home of Golf. The game, born in Scotland, continues to develop and evolve as one of the nation’s most valuable assets. Golf burgeoned on the East Lothian coast, in the towns of Fife and on the south-west coast in and around Prestwick. Clubhouses in some quarters are decorated with pictures and memories from yesteryear of Old Tom Morris and James Braid, the men who helped create the early increase in the game’s popularity. Fast forward six centuries and the game continues to thrive. Open Championship venues such as Royal Troon, the Old Course, St Andrews, Muirfield, Carnoustie and Turnberry entice golfers from around the world. And with more than 550 courses throughout the country, those looking to mix business with golf will be spoilt for choice. Neil Brownlee, head of business tourism at VisitScotland, said: "The 2014 Ryder Cup at Gleneagles has captured the imagination of the golfing world and it is a fantastic opportunity, along with the recent Glasgow Commonwealth Games and the events of Homecoming, to showcase Scotland as a business events destination. This country boasts numerous golf courses attached to stunning venues, from the Gleneagles Hotel in Perthshire to the Fairmont St Andrews and Old Course Hotel, Golf Resort and Spa at St Andrews – which has a boardroom that overlooks the world-famous course". 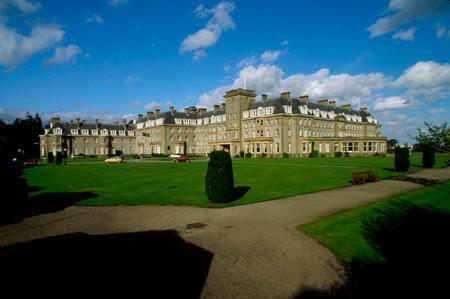 Other options include Archerfield House in East Lothian, with its three conference rooms, or the Macdonald Aviemore Resort, which also boasts stunning mountain scenery, to Trump Turnberry on the West coast.